Erenhot a city located in the Gobi Desert area of Chinese Inner Mongolia Autonomous Region close to the Mongolian Border is known as "Dinosaur City" because of the discovery of a number of different dinosaurs in its vicinity including the biggest and best-preserved dinosaur fossil in Asia. The city houses a dinosaur museum and in 2006 a huge welcome arch in form of two giant dinosaurs was built on the highway at the South entrance of the city. Each individual dinosaur statue is 34 meters wide, 19 meters high and the span of the two together reaches 80 meters. These statues are in the shape of Sauropoda (genera Brachiosaurus), largest animals to have ever lived on land. 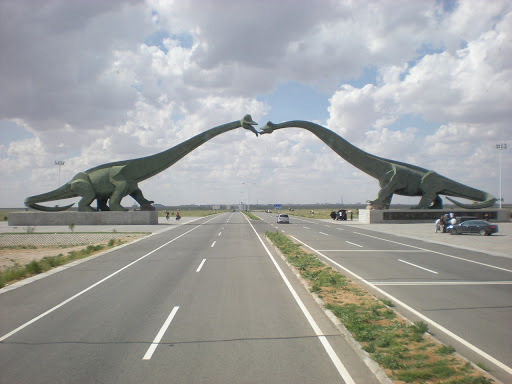 Besides this giant gateway, the main highway from the southern end to the northern end of the city is dotted with 48 dinosaur statues of varying sizes, located at various places along the the road. Reportedly the city authorities have approached Guinness World Records regarding its dinosaur statues. 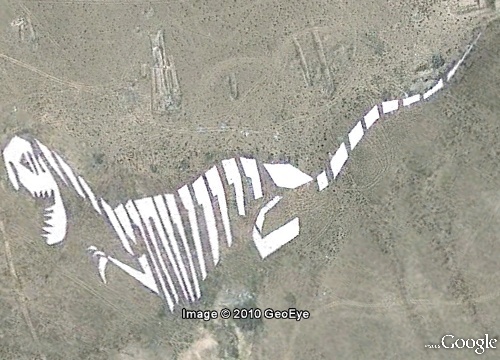 In addition to the statues along the road and near the museum, the museum area has several giant dinosaurs engraved on the nearby mounds. All these artworks are part of the effort to attract more tourists to the city. Credits: I am thankful to Kengrok, member (World Explorer), Google Earth Community, whose post entitled Erenhot - When dinos attack! 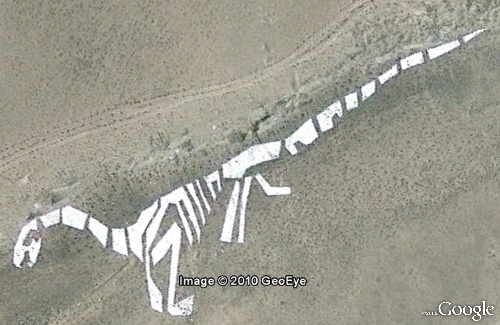 brought me to the town of Erenhot where I not only found the giant gateway but also the other dinos.